Hours spent navigating a computer can have negative health effects like painful carpal tunnel. Luckily there are ergonomic options like the Hippus Handshoe Mouse Light Click, which features a revolutionary contoured design that fits into the hand effortlessly, helping to curtail repetitive motion injuries. The device was actually designed for users with repetitive motion injuries, so even if you're working with strain this mouse can help slow its progress. 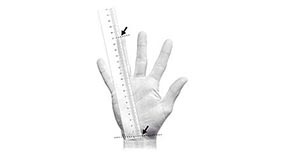 Optical sensor 1500 DPI "blueray"
To determine which size Handshoe Mouse Light Click is right for you, we recommend measuring the distance from the wrist to the tip of the ring finger (fourth finger) along the palm of the hand. See table below for sizing guide based on this measurement. 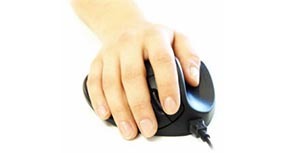 The Handshoe Mouse is available in both left and right-handed versions. I would rate this mouse five stars, except the buttons have WAY too light of a touch. On the positive side, it's very comfortable for my arthritic hand. It took some getting used to because it was hard to steer at first, but it glides nicely if you rock it back very slightly so most of the weight of your hand is at the pads under your wrist. Best mouse I've used. Very comfortable. The only thing I didn't like is the default button switching;that's a minor thing and easily adjusted. Overall, best mouse ever. Got the left hand version, even though we are all right handed. Decreased gripping of the mouse, medium nice size for us. Wife has arthritis and likes it. I find it very usable, and the kids play games with it. Actually, good to start the kids with this type of mouse. 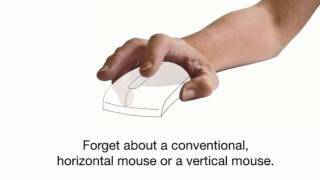 Right handed people would have no problem using the left handed version of this mouse if necessary. A little expensive, but we'll get a lot of use out of it. Thanks for a nice product, it can be very difficult to find something to fit everyone's needs. Love this and is so comfortable in your hand and have had no aching fingers since using it. Thanks for a great product. I am right handed but use my mouse in left as more comfortable and there is not much out there ergonomically for left hands. This product comes standard with a 2-year warranty. $109.00 List Price: $139.00* The list price is the same as the MSRP (Manufacturer's Suggested Retail Price). It may not necessarily be the price at which the product is sold.